Working through the digital fabrication process has proven to be a challenge for our group. As we developed the design, we made three separate attempts (up until the RPC deadline) to account for material thickness within the laser cutting pattern, each time without success. Our first attempt involved printing the unfolded units as a whole, as seen below. This configuration proved to be too difficult to assemble, as the triangular pieces were in the way as we tried to glue the quadrilaterals to the hexagon. Additionally, the holes in the middle of the hexagons were too small to allow the triangular pieces to attach comfortably. To try and remedy this situation, we decided to reprint the triangular pieces together, separate from the quadrilaterals and the base. We also adjusted the size of each piece to try and account for the material thickness. This attempt was more successful than the first, but the units still did not fit well together. We only had time for one more attempt at making adjustments for material thicknesses, so we maintained the same process of printing the quadrilaterals and hexagons together with the triangles separately for convenience of assembly, but we tried to adjust the score marks and lengths of the pieces one final time with the hope of creating a unit that would fit together well. Unfortunately, we were still left with poorly fitting units as our adjustments were not completely correct. One final problem we were having was keeping the correct orientation of all of the pieces after we decided to cut the triangles separate from the rest of the units. As can be seen in above images, we tried to employ a numbering system that was scored onto the pieces in locations that would later be covered up by another unit or a piece of felt, but even with this system, we still struggled with the assembly. The system worked well for knowing which pieces went together, but it did not help us with what orientation we should attach the pieces. The felt pieces and interior triangular pieces had a more in-depth system (1.1, 1.2, etc) and we should have employed that system on the hexagonal base pieces to best be able to assemble the units. Overall, we learned a lot from this experience because we were unsuccessful. The issues we faced with material thickness and the amount of material that can actually be folded together from one piece forced us to think in new ways that would have otherwise been impossible had we only viewed our design within the computer. It provided us with an opportunity to troubleshoot these fabrication considerations which will help us in the future to make more thoughtful design and fabrication attempts. Although our project did not turn out as we had hoped in the end, we are confident that with another attempt we could solve the problems we encountered and end up with a well-fitting unit. Below is our new board which indicates the changes in the fabrication process from one continuous cardboard piece into two smaller ones. The goal of the research into the geographic information system (GIS) was to discover ways in which the data it provides can be used to graphically inform the design process on an urban scale. 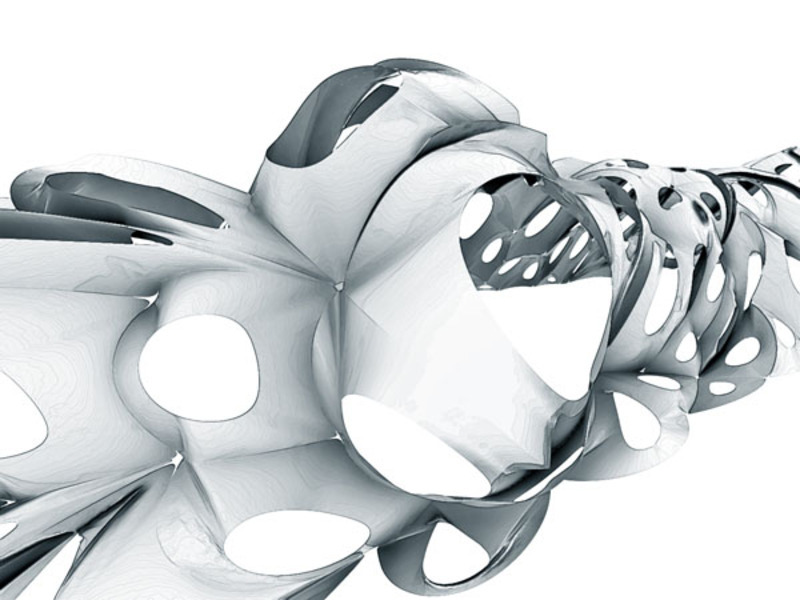 I approached the topic through an exploration of how the data can be reinterpreted in both two and three dimensions through the use of ArcMap, Rhino, and Grasshopper. First, within ArcMap, GIS shape files (.shp) can be loaded through dragging and dropping them into the interface. Each shape file contains a certain amount of data associated with it that can be seen in the table within ArcMap. To explore other information that is not included in that table, another table can be joined as long as both tables have one column in common. Through the ArcMap Symbology tab, color fills and dots can be used to graphically represent two-dimensional information. Multiple layers of data can be displayed on top of one another so a variety of factors can be compared at once. The tables within ArcMap can be exported to a .csv file and the line work of the shape file can be exported as a .dwg file for integration with Rhino and Grasshopper. Once in Rhino, a Grasshopper script can be run to interpret the data from the excel file. If there is trouble loading the excel file, be sure to try toggling the true/false option to refresh the imported data. The particular script I used extruded blocks based on the numbers in a specific column within the spreadsheet. It is important to note that it may be easier to manipulate the data in excel before importing it into Grasshopper, especially for first time users. If there is a function you want to run based on the data that can be achieved in excel, it may be useful to create another column with that manipulation rather than trying to write a Grasshopper script to achieve the same result. Loading two columns separately from one another allows for the comparison of multiple factors. A slider between these factors directly controls the mixture of their data – a value of 1 is 100% data from column A where a value of 0 is 100% data from column B. Any value between 0 and 1 will produce a combined result to a certain percentage. This could be utilized to create an animation depicting the change of one factor over time or the morphing of one factor into another, which could be very useful for analyzing an urban condition such as population distribution. Right clicking on the slider will bring up an animation menu where the exact information regarding the animation can be entered. The blocks can also be divided through the Voronoi tool within Grasshopper to create a more intricate and perhaps more informative diagram. These shapes can further be extruded in different ways, i.e. as solid blocks or as donut shapes. The alternate extrusions could symbolize the land use or some other factor while the amount and color of the extrusion could be based on something else, such as property value. The appearance of the gradient, the amount the extrusion, and the divisions of the blocks are all controllable factors within this script. All of these variables are simply options to explore in order to best convey the analysis desired. Essentially, the extensive GIS database of information has the ability to be efficiently transformed into a highly informative graphic diagram through manipulation with Excel, Rhino, and Grasshopper. Overall, this process is fairly simple and quick, offering the designer the ability for rapid analysis and design development that is not necessarily possible through traditional methods of representing data such as bar graphs and pie charts. As a group, our goal was to explore and define the capabilities of geographic information system (GIS) data within the scope of architectural and urban design. GIS includes a variety of data from demographic and population information to land use, infrastructure, transportation, water, building type, natural resource, and neighborhood information, and can be used to map locations, quantities, densities, and factors over time. The benefits of GIS include its efficiency, adaptability, and capability for visualization. Architects, urban planners, developers, businesses, and governments can all easily use these figures to help inform their decisions about large-scale interventions, expansion opportunities, transportation routes, and amenity locations. While statistical information can be helpful, it is also often times misleading, and diagrams driven by such data are often times much more helpful for accessible interpretation. The possibilities for diagrammatic representation of GIS figures include simple 2-D graphics within ArcMap, more complex 2-D graphics driven by excel through the use of Grasshopper and Rhino, and 3-D graphics and animations that utilize similar technology. In an attempt to quickly learn as much as possible about the visual opportunities provided by GIS data, we chose to research specific individual topics within the realm of diagrammatic representation. Each group member examined a different set of factors in the same geographical area of downtown Cincinnati to demonstrate the range of analytical opportunity GIS data provides while keeping a consistency for easy comparison between methodologies. ArcMap is by far the most simple and accessible means of diagramming for several reasons: the software is free, it is specifically made to interpret GIS data in a graphic format, and the interface is user-friendly. It is an extremely useful tool to gain a quick analysis of several factors as Michelle discussed further in her essay, however, manipulation of the data or graphic output is limited and the visual interest of the images is lacking in comparison to those produced by Rhino and Grasshopper. Above is a diagram produced with ArcMap overlaying amenity and population data. Rhino and Grasshopper together are a very powerful toolset for more intense manipulation of the data, especially for presentation quality images. Benefits of this workflow include: greater editing capabilities, greater opportunity for data manipulation, further analysis through a variety of tools that are unavailable in ArcMap, and the possibility of fluid analysis of multiple factors over time through animation. Some of the drawbacks include: the expense of Rhino (although there are discounted rates for students), the workflow of Grasshopper as it is vastly different from most of the other programs we have been exposed to, and the increased time of manipulation. In general, if more than a cursory understanding is required, it is worth the investment of time and money to employ Rhino and Grasshopper. Above is an example of the process of working with the MetaBall command in Rhino and Grasshopper to analyze park information. Below is a diagram using the vironoi and extrusion capabilities within Rhino and Grasshopper to analyze population data. Simple extrusions based on excel data are a very helpful visualization tool, especially if they are animated between factors or over time as discussed further in Lydia’s essay. Other tools such as the metaball and vironoi operations provide a more conceptual level of analysis and graphic appeal that just isn’t attainable through ArcMap, a more detailed explanation of which can be found in Baixin’s essay. The possibilities within Grasshopper are essentially endless as the user can create scripts to run any type of visual analysis desired. Also, through the use of Excel, Rhino, and Grasshopper, there is the opportunity for editing at all levels. Manipulation can occur within any one of the programs for the most efficient exploration of information. For beginners in Grasshopper, it may be helpful to perform functions or other data manipulation within excel, and then import the excel file into Grasshopper rather than running the functions through a Grasshopper script. Also, graphic changes can be made in Rhino pre or post-Grasshopper for completely fluid editing capabilities. Through our research, we found that the opportunities for diagrammatic GIS analysis are essentially endless and completely up to the user. Any information that is provided in the GIS database can be employed to explore a question regarding design at the urban scale. There is the possibility for comparison of one or many factors at a specific date or over time, depending on what best informs the inquiry of the designer. This information can further be communicated in a variety of two and three-dimensional diagrams controlled by ArcMap, Excel, Rhino, Grasshopper or any combination. Utilizing the acoustical properties of both a suspended curve and a baffle structure, we are proposing a laser-cut waffle assembled cloud structure. Our different iterations are exploring the possibilities of varying sizes and intersections of the planes, the potential for a unit to determine the overall composition, and a prospective curved surface shape that could be assembled with the waffling technique. This installation was done for the celebration of MIT’s 150th birthday celebration. It was installed in a corridor that connects two buildings on campus and was meant to reference the vaults of historic cathedrals. The construction of this form involved using strips of material for an easier manufacturing process. voltaDom is relevant to this project for many reasons: it takes a very complex form and breaks it down into a series of more manipulatable parts; it is an exploration in surface conditions and how varying surface depths can control space; it references a historical context in a modern sense, which could be a design strategy for the Niehoff Studio; and it successfully creates a focus on light and view, both from inside the construct into the surrounding space, and through that space to the exterior. 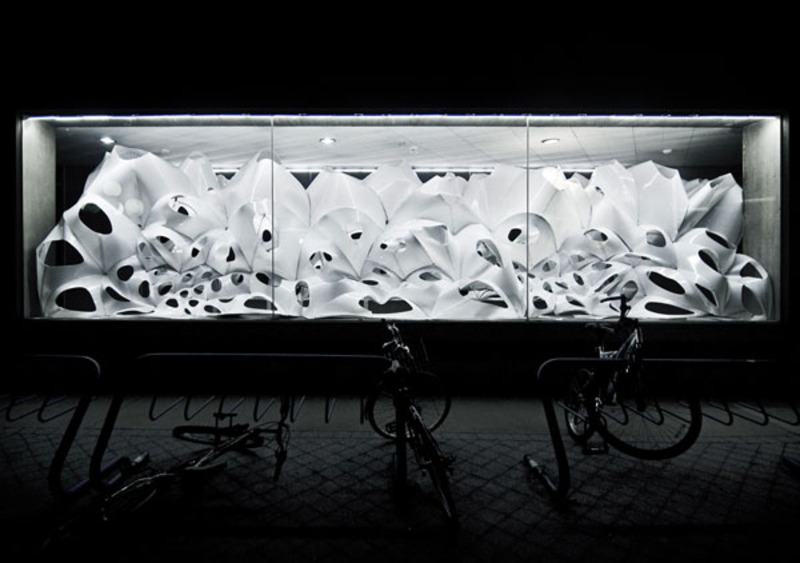 It would be interesting to create a parametric surface with varying depths and resulting visual and acoustical transparencies that could either be suspended and encapsulate a space, or stand alone as a partition depending on the manipulations.